Thu, Apr 11, 2019, 11:23 pm SL Time, ColomboPage News Desk, Sri Lanka. Apr 11, Colombo: Provider of operational technologies and services, Navis, a part of Cargotec Corporation and Sri Lanka's South Asia Gateway Terminals Ltd. (SAGT) announced an agreement to utilize Navis optimization and analytics services to help the terminal prepare for further growth. 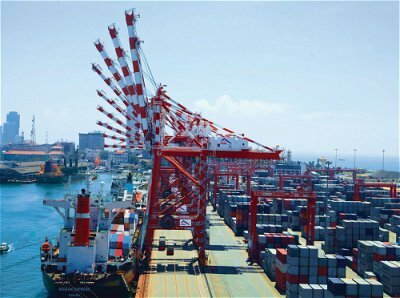 The Port of Colombo, located in the South-West corner of Sri Lanka is rated amongst the top container ports in the world. SAGT is located in the port of Colombo at what was the renowned and historic Queen Elizabeth Quay. The port�s natural geographic location is a superb strategic hub positioned on the main East West shipping route, linking the Far East with Africa, Europe, and the East Coast of the US; providing ideal connections to the trade in the Indian sub-continent. In 1999 SAGT set out on its quest to set benchmark standards in terms of service excellence, productivity, efficiency and consistency. Having achieved global acclaim and with vision to be the "Most Trusted Gateway in the Indian Ocean", today, SAGT continues its commitment to maintaining best practices and international standards of productivity and efficiency to its Customers through innovation, continuous improvement and great teamwork. SAGT has been running Navis solutions for around 20 years, and is achieving strong productivity levels, enabling the terminal to attract a large customer base. At the end of 2018, the terminal recorded two million TEUs with original design capacity of 1.1 million TEU capacity, and thereby needs to optimize even further to handle the increasing volumes and growing business. Elements of the improvement program with Navis Services include yard strategy improvement, terminal truck optimization, ITT optimization and control room optimization, all supported by proper KPI measurement and analytics using the Navis BI Portal. "We are very pleased to be expanding our relationship with Navis to engage in value-added optimization services that go well beyond initial implementation," said Romesh David, CEO at SAGT. "We have grown a successful business alongside Navis, and look forward to continuing to work with them to drive efficiencies, analyze performance and ultimately deliver even better customer service." "Our ongoing partnership with the SAGT is a testament to the terminal�s commitment to continued excellence and innovation as a strategic Asian port," said Bruce Jacquemard, Chief Customer Officer at Navis. "SAGT realizes the value of getting the most out of operations and analytics through our optimization services and sees the long term opportunity to attract more customers and deliver superior service to a growing volume of top-tier carrier business. We look forward to extending our long relationship with SAGT." Navis, a part of Cargotec Corporation, is a provider of operational technologies and services that unlock greater performance and efficiency for the world�s leading terminal operators and ocean carriers.